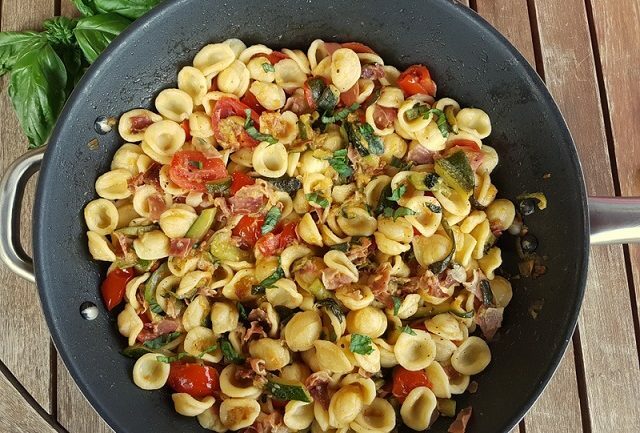 Orecchiette pasta with Zucchini and Speck. 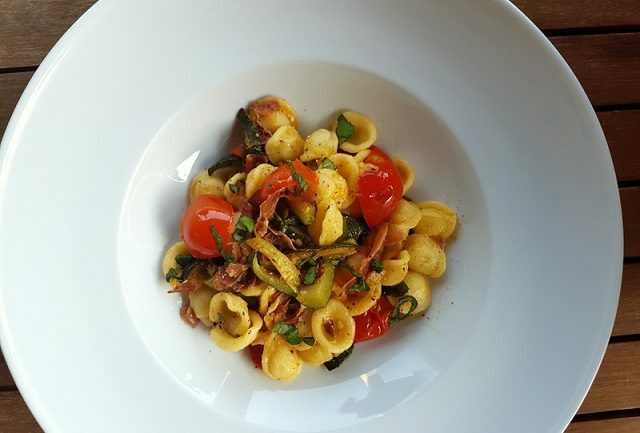 Orecchiette pasta with zucchini and speck is a real tasty combination of summer vegetables, smoked cured ham from Northern Italy and fresh orecchiette pasta from Southern Italy. 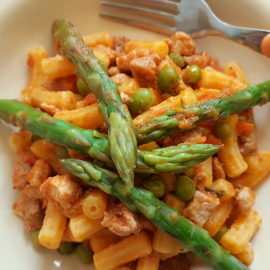 It’s easy to make and can be eaten tepid or cold as a pasta salad. 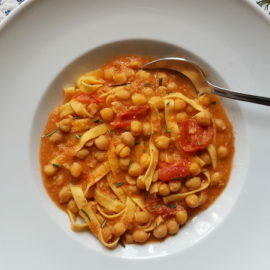 Much like other cuisines around the world, traditional Italian recipes are very often seasonal. This is because many were invented at a time when refrigeration wasn’t an option and neither was buying the raw ingredients out of season or having access to ingredients imported from other parts of the country, let alone the world. 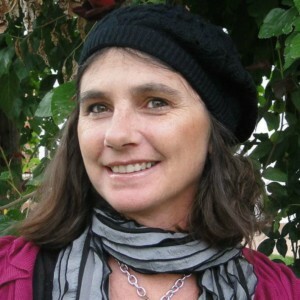 People ate what they could grow or purchase at local markets. In the winter months, when there were no crops to pick, they made use of ingredients they had preserved in salt or oil or by smoking or drying etc. 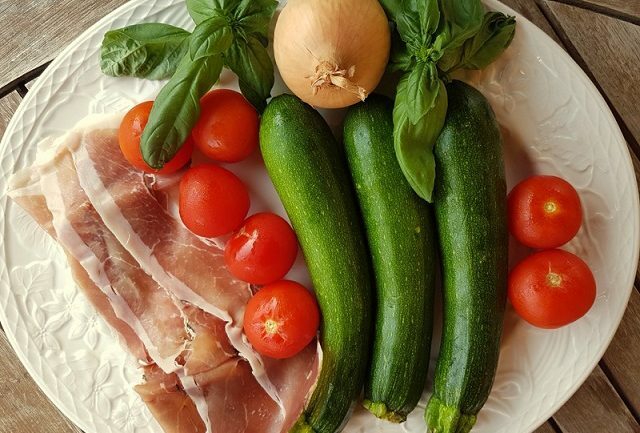 Despite the fact that today Italians can find non-local or even imported food in their supermarkets, the habit of using locally grown, seasonal ingredients is still second nature here. The climate also very much dictates what Italians eat. In winter, food is heartier, sauces richer and quantities consumed greater because its colder, especially in the north! At the time of writing, summer vegetables and seafood hold court. It’s just too hot for those heavier meals! I have been wanting to make orecchiette with broccoli rabe (the most traditional way to serve orecchiette) for a while, but I’m going to have to be patient. Broccoli rabe isn’t available now. So this recipe is for a more seasonal orecchiette dish. In other words, with ingredients that are in season now in summer. After tomatoes and eggplants, I would say that zucchini are the Italians’ next favourite summer vegetable. 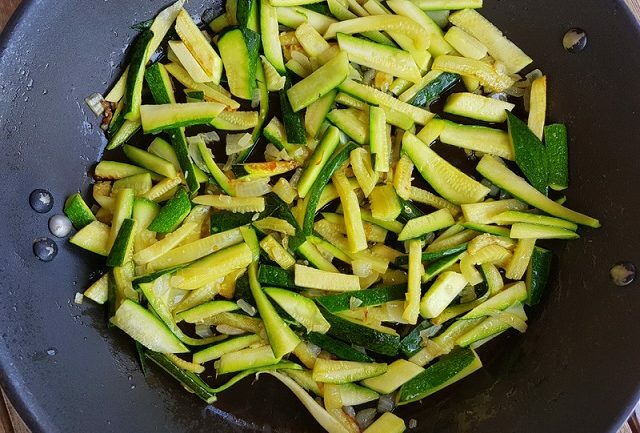 Much more abundant in summer than winter, zucchini find their way into numerous dishes at this time of year, especially pasta recipes. In English, zucchini are also known as summer squash or by the French word ‘courgette’. However, everyone seems to be familiar with the word zucchini. Rightfully so, because the zucchini most people eat in Europe and USA are originally Italian. In fact, when zucchini started to become popular around Europe, the French snubbed them for a long time! The word zucchini comes from the Italian zucchino, meaning a small squash. Ancestors of zucchini had been eaten in South and Central America for thousands of years before Christopher Columbus, apparently, brought the first seeds to the Mediterranean region and Africa. But, the zucchini we all know and love were developed in Italy in 19th century! 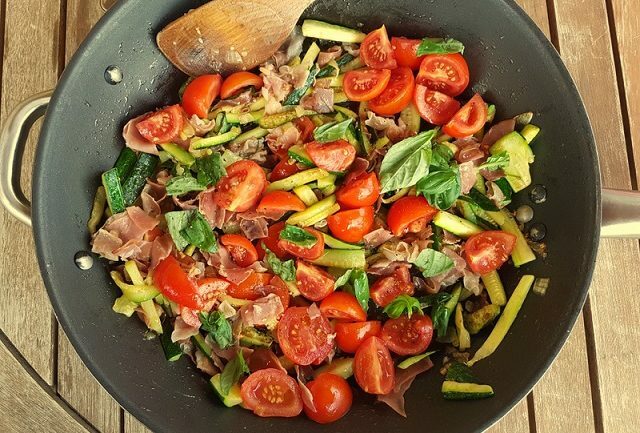 Recipes for pasta with zucchini and speck or pancetta are also popular in many parts of Italy. I decided to use speck which comes from the area in Northern Italy called the Alto Adige or Südtirol. Speck is one of the most well-known food produced in the Südtirol. It is a distinctly flavored, smoked, cured ham which is more robust than the delicate prosciutto made in San Daniele and Parma. A kind of cross between bacon and ham! I love it and so do most of the Italians, North and South. 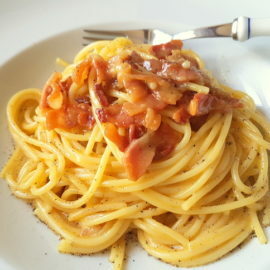 However, if you can’t find speck, you can also use pancetta in this recipe. 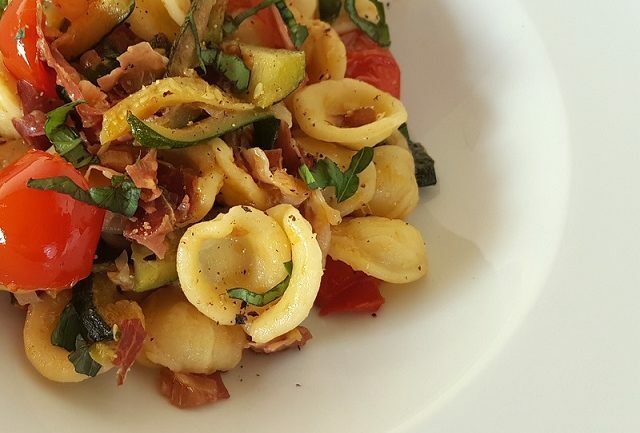 I came across this recipe for orecchiette with zucchini and speck when searching Italian recipe sites for another good summer recipe for orecchiette (the one I made before with roasted tomatoes was a real winner). This sounded delicious and it was! 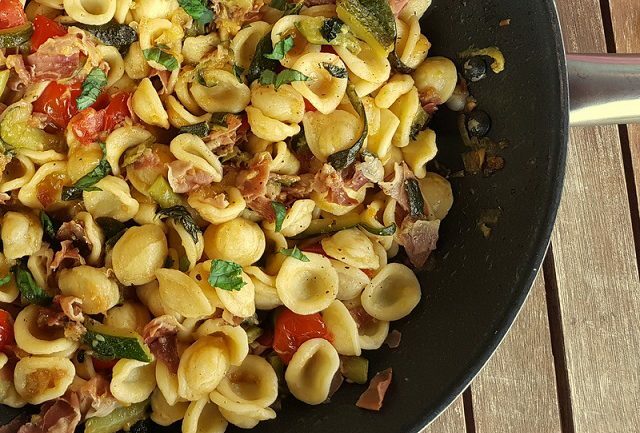 Of course, it can be made with other types of pasta but having made it with orecchiette I don’t think I’d repeat it with a different pasta. The pairing was perfect! Give it a try and let me know what you think. 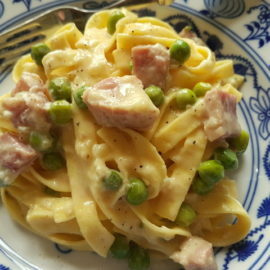 We had this for dinner tonight (with pancetta). Everyone loved it!